The nearly three-week strike targets poorly paid prison labor, prison conditions and life-long sentencing, and was spurred by deadly riots earlier this year at the Lee Correctional Institution where seven inmates were killed. Through labor strikes, hunger strikes and sit-ins staged from Aug. 21 to Sept. 9, protest organizers are demanding an end to what they see as exploitation and racism in the world’s largest incarceration complex. “Prisoners understand they are being treated as animals. We know that our conditions are causing physical harm and deaths that could be avoided,” Jailhouse Lawyers Speak, a nationwide inmates’ collective, said in a pre-strike statement. “Prisons in America are a warzone,” it added. It’s unclear how many of the almost 2.3 million people serving time in America’s vast incarceration system will risk substantial penal retaliation to join the protest. But the movement has the potential for massive operational disruption as correctional institutions rely on prison labor, from cooking and serving the meals, to washing the laundry, to maintaining the grounds. As correctional facilities from coast to coast are hit with strikes, here’s what to know. 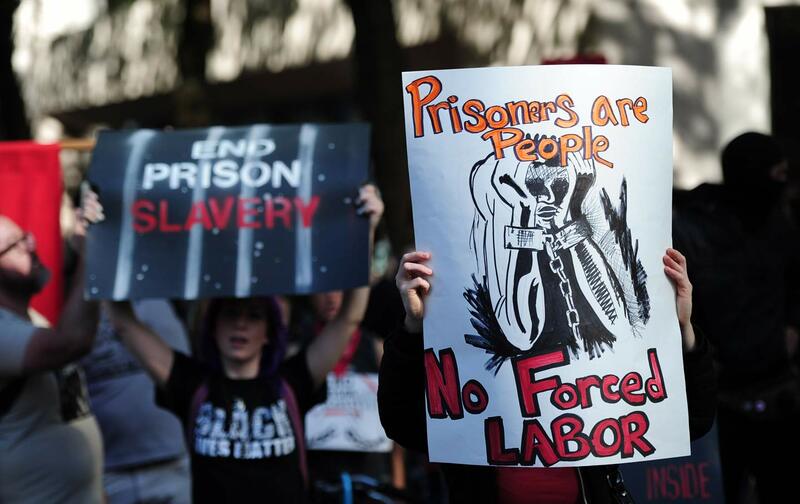 Led by inmate organizations like Jailhouse Lawyers Speak and Incarcerated Workers Organizing Committee, the 19-day strike has countrywide reach with at least 17 states reportedly participating so far. The strike comes in response to bloodshed at the Lee Correctional Institution in South Carolina, which was deemed one of the deadliest prison brawls in recent memory. At the April 15 uprising, sparked in part by gang-related violence, at least seven inmates bled to death from stab wounds, while 22 others suffered injuries. “South Carolina is only a reflection of the issues facing other states and governmental buildings of confinement. This is a systematic problem born out of slavery that this nation must come to grips with and address,” Jailhouse Lawyers Speak said in its strike manifesto. Strike organizers have spelled out 10 demands, including improving living conditions to “recognize the humanity of imprisoned men and women” and ending racialized sentencing that discriminates against “black and brown humans.” They are demanding an end to “death by incarceration,” or sentences without parole, and calling for increased spending on rehabilitation support. The strike also hinges on prison labor, which is often compulsory and remunerated in just pennies. Thousands of captive laborers go to work each day for the multi-billion dollar, for-profit prison industry, yet some reportedly earn as little as 4 cents an hour. David Fathi, director of the American Civil Liberties Union (ACLU) National Prison Project, points out that even in states that do not operate compulsory labor schemes, the power discrepancy between the inmates and those who guard them leads to possibly coercive scenarios. Prisoners are in “a situation where the usual checks on employer exploitation and abuse simply don’t operate,” he told the BBC. Prison labor captured a national spotlight amid the devastating wildfires in California, when it was revealed that many of the volunteers risking their lives are inmates getting paid just $1 an hour.